Heat oven to 350°F. Grease bottom and sides of 13x9-inch pan with shortening or cooking spray. In large bowl, stir mashed bananas, granulated sugar, milk, oil, cinnamon and eggs. Stir in 2 2/3 cups Bisquick mix and 3/4 cup walnuts; fold in banana slices. Pour mixture into pan. Bake 30 to 36 minutes or until knife inserted in center comes out clean. Cut into 4 rows by 3 rows. Drizzle with maple syrup just before serving. Make-Ahead Directions: Make as directed through step 3. Cover and refrigerate up to 12 hours. Uncover, and bake as directed in step 4. 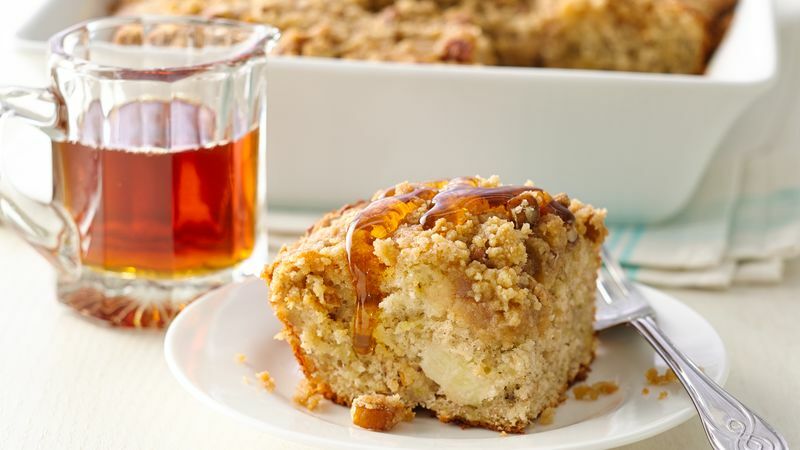 Cover any remaining coffee cake, and serve within 3 days.